Since I will be camping most of the way, I will essentially be living in a tent for 2 months. So - I went to MEC (Mountain Equipment Coop) here in Vancouver for some new camping equipment. 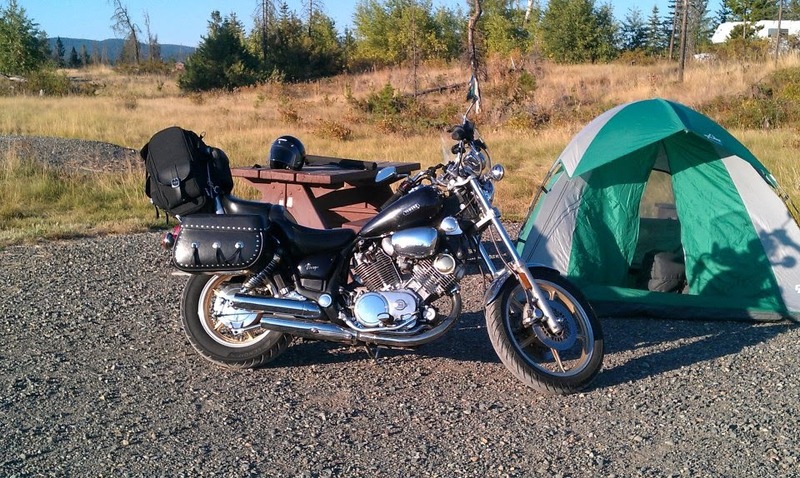 First, I got a new sleepy-bag that will fit in the little cylinder that attaches to the top of my sissy-bar pack. It's about 10 litres, so I had to get a down bag. But it fits pretty well. Next, a tent. I need something roomy, especially with some height, because I may end up spending a day inside if it's pouring rain. I chose a "4-person" that's 1.5 meters high inside which, although I can't stand up in it, at least it's not claustrophobic. The best thing about it is you don't have to thread the poles through anything - just pull them up and snap on the tent. I also got a pillow and a very collapsible water-jug: the cheap transparent plastic ones leak after 2 or 3 foldings. One thing I did not get and I'm still searching for: a mattress. I thought of a cot, but they do not pack up small enough to fit on the bike. So: air mattress. But they're either a kid's toy or a "full" bed - usually at least 39 inches wide. I'm looking for something that would be just bigger than the sleeping bag - maybe 30 inches wide. And DURABLE - it can't spring a leak after half a dozen uses! Weather's starting to get warmer - won't be too long before I get the bike on the road! I'm looking forward to a "dry run" up to Tunkwa Lake with my new toys.